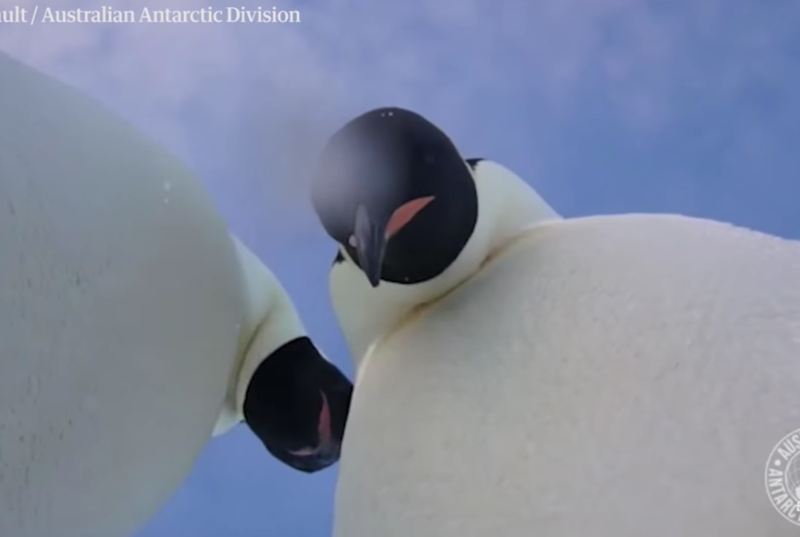 Teacher Resources > Monday Morning Ready > Two Antarctic penguins took an adorable "selfie"
In the article, the writer calls the pictures of these curious penguins "very adorable." Imagine that the camera had captured images of a different animal, like an orca or a polar bear. What words do you think the writer would have used to describe those pictures? Why? According to the article, several things helped expeditioner Eddie Gault capture footage of penguins with his camera. One, he left the camera near the penguins' favorite haunt. Two, a large colony of emperor penguins was nearby. Three, he left the camera on. And four, penguins are naturally curious animals. If you wanted to capture a "selfie" of an animal, which animal would you try to capture on film? What would you do to increase your chances of success? What do you think people can learn about animals from studying "selfies" of animals? According to the article, the People for the Ethical Treatment of Animals sued British wildlife photographer David Slater for infringing on the copyright of a monkey after he published an image that the crested black macaque took of itself. Imagine that you were on that jury. Would you have sided with Slater or PETA and the monkey? Why? Invite students to share what they know about penguins. What are they like? Where do they live? What do they eat? How do they grow? Cover as many topics as possible. Point out that penguin populations around the world face a variety of threats. Many of those threats are man-made and they are endangering penguins across the globe. Inform the class that people are working hard to keep penguin populations from becoming extinct. But one key part of the problem is education. Scientists need to conduct more research to fully understand the problem. And they need to share their results in a way that everyone can understand. Instruct students to select one species of penguin and conduct research to learn more about it. Encourage them to identify key problems that threaten the future of that species. Then have students use what they learned to create a poster for a Save the Penguins campaign. As a class, brainstorm a list of commonly known facts about penguins. Divide the class into small groups. Instruct groups to conduct research to learn more. Then give them time to create a poster for a Save the Penguins campaign. Divide the class into small groups. Have groups brainstorm a list of commonly known facts about penguins. As they do this, remind them to consider the different species of penguins and the various habitats where they live. Give groups time to create a poster for a Save the Penguins campaign focused on a specific habitat. Divide the class into small groups. Have groups brainstorm a list of commonly known facts about penguins. Then have each group select one penguin species and conduct research to learn more about it. Instruct groups to identify a key threat the species they chose faces and summarize possible solutions. Give groups time to create posters highlighting what they consider to be the best solution. Divide the class into pairs. Have partners conduct research to learn more about penguins. Encourage them to focus on man-made problems that threaten penguin populations and the ideas people have tried to solve those issues. Instruct partners to select one penguin species and a key problem/solution people have attempted to address. Give them time to create an educational poster that will inform the general public and encourage people to take a stand to help this penguin species. Learn all about penguins and the human impacts and solutions that affect their lives on this site from the Smithsonian’s National Museum of Natural History. Which penguin swims the fastest? Do penguins have teeth? Why do penguins sneeze? And how is penguin poop useful? If you’re curious, read this Smithsonian magazine article to find the answers. Penguins are odd and beloved birds. Invite students to watch this video from the National Museum of Natural History to learn facts about penguins and why these strange birds can be described as the proverbial canary in the coal mine of our oceans. Can satellite imagery determine how many Emperor penguins are left in the world? Read this Smithsonian magazine article to learn about the scientists who journeyed to the icy bottom of Earth to find out. This teaching resource from the National Museum of Natural History explores everything from the human influences on bird populations to the technology ornithologists use to study and protect bird species. Use the videos, webcasts, lessons and online activities to help students investigate penguins and other bird species that are under threat today. Watch this Smithsonian Channel video to learn how biomechanics experts used their observations of penguins to understand how a 45-foot-long underwater prehistoric predator kept up with its prey. Read this Smithsonian magazine article to learn about the world’s smallest penguin, which is struggling to find fish in warmer waters. With populations in steep decline, researchers are raising African penguins and releasing them into the wild. Watch this video, courtesy of Smithsonian magazine, to learn about their conservation efforts.